We at Celtic Compressors pride ourselves on the quality of our general service and breakdown cover procedures. Many of our customers are long standing and we think this is testimony to or commitment. We provide a professional, knowledgeable, efficient and cost effective after sales service with around the clock cover. 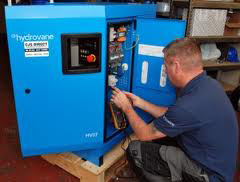 Our technicians are available 24 hours a day, 7 days a week for both routine maintenance and fault finding to help ensure your compressed air systems is fully functional at all time. Our service vehicles are well stocked with spare parts and we are able to achieve a ‘first time fix in many cases. We can offer tailor made maintenance plans to suit your individual needs - from 1 service per year to many. We can even include all dryers, filtration, condensate drains, air purity tests and air leak survey should you require it. We are pleased to offer any quotations obligation free. Copyright © Celtic Compressors & Pneumatics Ltd.